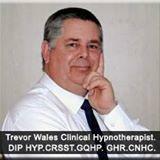 Trevor Wales is a fully quailifed clinical hypnotherapist,health and wellness and success coaching professional with over a decades experience,helping both individuals and businesses to improve peroformance and quality of life by providing effective health,wellness and success coaching solutions. Trevor's services are available one to one and in groups throughout Cornwall,Devon and Via Skype and Google hangouts throughout the UK and worldwide. Trevor has four key specialisms which are Stop Smoking, Weight loss,Self Confidence Improvement and Anxiety and Panic Attack Issues.Trevor has also worked successfully for several years in the area of relationships and psycho-sexual issues. Trevor has various therapy practice locations across Cornwall but is primarily based in a very convenient location at 10 South Street,St Austell where he conducts face to face individual therapy clinics.This facility is very conveniently placed for Bus,Train and public car parks. Trevor also has another practice location on the outskirts of St Austell at Pine Lodge Gardens which is disabled friendly and has free car parking. In addition to the St Austell South Street base Trevor runs therapy clinics in Bodmin and Truro and offers home visits for people with travelling difficulties. For success coaching,weight management and quit smoking workshops for groups of five or more individuals Trevor Wales Hypnotherapy solutions runs workshops in various venues across the county that are suitable for both businesses and groups of people. For clients and business who are unable to get to him and where it is not practical for him to travel to them Trevor also works very successfully with Skype and Google hangouts both nationally and internationally. Business may be interested to note that Trevor is able to help in the development and improvement of various aspects of 'people handling skills' in customer facing businesses. Trevor has been involved in HR and training in the sales and retail industry over many years in both mainstream and specialist niche market arenas, coaching people in communication and listening skills, building rapport with people,reading'body language', reocgnizing buying signals, handling objections and helping employees to develop greater self confidence. With the skills devoped in his professional life over thirty years and as a hypnotherapist and success coach Trevors unique approach is appropiate and ideally placed in helping business to improve performance where dealing with the public. Trevor is a member of the General Hypnotherapy Register,the Complimentery and Natural Healthcare Council,Member of the Institute of Brain Working Recursive Therapists and Central Register of Stop Smoking Therapists. Trevor is covered by full professional liabilty insurance.